The Royal Australian Navy’s (RAN) first of 24 MH-60R Seahawk Romeo helicopters has successfully completed its first flight test at Sikorsky’s production facility, Connecticut, US, defence materiel minister Dr Mike Kelly has announced. During the initial test flight, the helicopter validated its controllability, engine performance, vibration analysis and navigation in addition to undergoing the contractor flight acceptance. Purchased through the foreign military sales process from the US Navy, the Sikorsky and Lockheed Martin-built MH-60R helicopters will provide air-to-surface strike capabilities and replace the RAN’s ageing 16 Seahawk Classic helicopters. Kelly said that the federal government has invested more than $3bn on procurement of 24 MH-60R Seahawk Romeo helicopters to boost Australia’s ongoing air combat capabilities. "The US Navy and its industry partners have worked hard to accelerate the Romeo acquisition programme and this first flight occurred only two years after contract signature, some six months ahead of the original schedule approved by government in 2011," Kelly said. "The US Navy and its industry partners have worked hard to accelerate the Romeo acquisition programme and this first flight occurred only two years after contract signature, some six months ahead of the original schedule approved by government in 2011." The purchase of 24 Seahawk Romeos will help the Australian Navy to embark at least eight Seahawk Romeos with Australia’s Anzac-class ships and the new Hobart-class air warfare vessels while the remaining aircraft will be based at HMAS Albatross in Nowra, New South Wales, Australia. 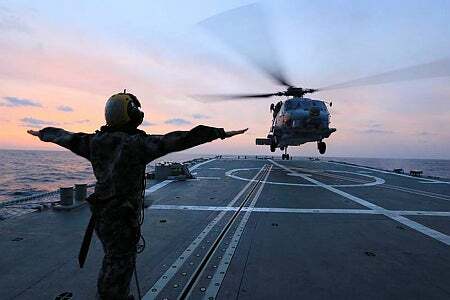 Australian Navy’s Fleet Air Arm commander commodore Vince Di Pietro said: "The RAN will very shortly be flying the most capable anti-submarine and anti-surface helicopter in the world and it will be a quantum increase to our current helicopter force, both in numbers and capability." The first MH-60R multi-role naval combat helicopter will be integrated with mission systems and sensors following its transition to Lockheed Martin’s facility in Owego, New York, US. The next three aircraft are currently undergoing various stages of assembly phase and the navy is expected to receive the first two helicopters in December 2013. Image: A MH-60R helicopter performs landings missions aboard HMAS Sydney. Photo: © Commonwealth of Australia 2013.